I caught up with Wooster Geologist Clara Deck (’17) at the AGU meeting in December. 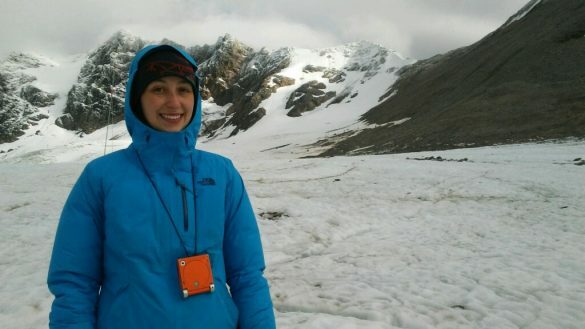 Clara is a grad student who has been doing exciting research on glaciers. I asked her to tell us a little about her research and how her experience at Wooster helped her prepare for grad school. She discovered that her research has called on concepts and skills from Structural Geology and Computer Science. Stories like Clara’s motivated us to design our Geology and Environmental Geoscience majors to be flexible, allowing students to explore their interdisciplinary interests and pursue their passions. We’ve also added computational methods to our curriculum. Thanks, Clara, for the inspiration! Clara Deck on Jarvis Glacier in the East Alaska Range, August 2018. As a master’s student at the University of Maine’s School of Earth and Climate Sciences, my research has focused on dynamic processes of Antarctic Ice Shelves. Glacial ice in Antarctica flows outward to sea and creates tabular masses called ice shelves, which are tethered to about 75% of the continent’s coastline. These floating ice shelves are critical to the stability of land-based ice because they keep glaciers from flowing freely into the ocean and contributing to global sea level rise. The Ross Ice Shelf (RIS) is the largest in Antarctica and supports the flow of the West Antarctic Ice Sheet, which contains an ice volume of over three meters of global sea level equivalence if it were to enter the ocean. At the western coastal margin of RIS, ice is continuously dragged along protruding bedrock features and becomes deformed, exhibiting large cracks or rifts over a kilometer in length which can be seen in satellite imagery. If a rift were to propagate across RIS, the ice shelf could break up and allow land ice to flow seaward much more quickly. My thesis work aims to characterize the origin and evolution of rifts on RIS using three-dimensional modeling. 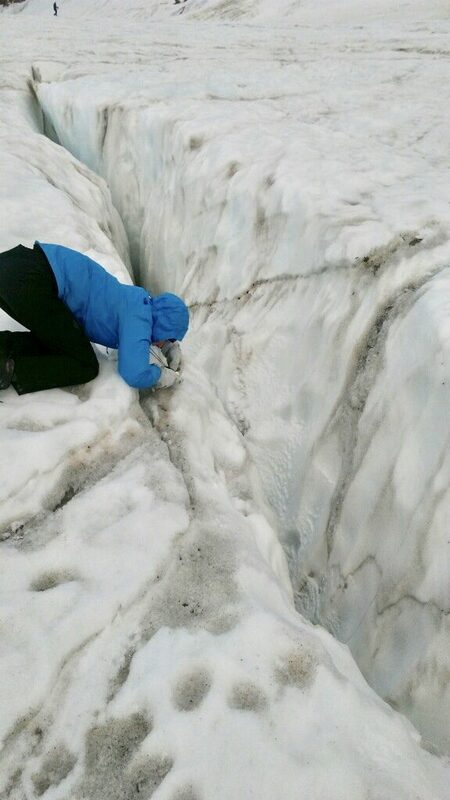 Mapping a crevasse on Jarvis Glacier. I never expected this, but Structural Geology was one of the most helpful classes at Wooster to help me prepare for my graduate work on glaciers and ice shelves. The same stresses at play in tectonics are important within ice, just on a different temporal and spatial scale. I wish I had known that these processes, ductile and brittle, from the micro- to macro-scale, were also applicable to ice! Evolution of rifts on the Ross Ice Shelf with ice flow, shown through optical imagery from Landsat 1, Landsat 4, Landsat 7, and Sentinel 2, respectively. At Wooster I took CSCI 100 and 110, classes in Python and C computing languages. These were helpful to learn basics in computing syntax, but it was a steep learning curve in graduate when using computing for glaciological applications. It would have been really useful to have had some background in modeling and writing code related to geological physical processes. I’ve been excited to hear that some modeling is now incorporated into some courses in the Earth Sciences department. Another surprise when starting my master’s was how much calculus is involved in glaciology. I took calc 1 and 2 at Wooster, but I still had quite a bit to catch up on. For students going into climate change or cryospheric studies, I think learning quantitative analysis is just as important as the qualitative side. Model of a floating ice tongue showing the differential stress field due to buoyancy force from underlying marine water. Solved using a particle approximation of Navier-Stokes for forces associated with water and finite element analysis for high viscosity ice. 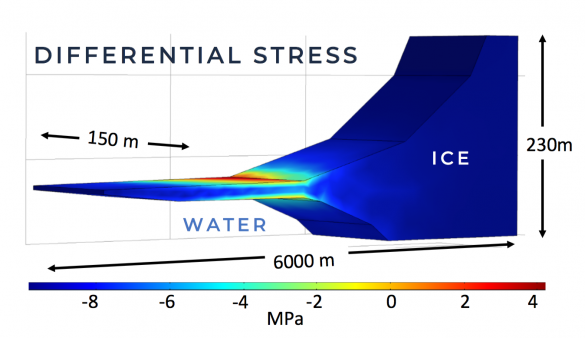 This model explores the connection of ice shelf deformation with upstream grounding line processes. Overall, I feel that Wooster Geology prepared me very well for my graduate studies. Because of Sophomore Research and I.S., I had a lot of experience in independent research, seeking out my own resources, and laying out my own goals and timeline. All those skills have helped me be successful so far, because I’ve found that much more responsibility is put on the student at the graduate level. I’m glad I pursued grad school and I hope to defend my master’s thesis this spring!